It’s summer, and that means there are a lot of parents out there enjoying some quiet time after shipping their little ones off to camp. Sounds ideal for the parent, for the kid and the unfortunate camp counselors of the world, it sounds like a bloody nightmare waiting to happen. If you really want to freak your offspring out (I know, this is going to make me sound twisted), sit them down for a few of the films on this list before they get to rolling their sleeping bags up. Camp will never be the same again! This is basically the camping prototype flick. A few of its nature definitely pre-date Friday the 13th, but none feel as magical, and very few seem to place so much emphasis on setting. Campgrounds make for a stellar horror setting, so why not nurture that, and make the location as much of a character in the film as one of the camp counselors, or our machete wielding maniac? Friday the 13th, particularly the first few flicks, did a wonderful job of placing a spotlight on the campgrounds, and it helped pay major dividends. A story that bears some extreme similarities to the Friday franchise, The Burning actually found inspiration in a familiar east coast urban legend known as Cropsey. It’s easy to point to this one and label it a Friday rip-off, but it’s good to acknowledge the different inspiration for the story. Cropsy is a savage killer, and if you show up anywhere near the local campground, you might end up with a pear of gardening shears stuck in your eyeballs. I love the fact that Cub switches things up on viewers anticipating a hulking monstrosity of a man stalking a bunch of wily youngsters. No, there’s no hulking monster in this one, it’s just a stealth, ninja-like little booger with a creepy look and a penchant for all things anti-peace. The film has picked up quite the following since arriving three years ago. This one is well-written and often surprising – it isn’t as easy as 1-2-3 to figure this one out. Here’s another campground slasher that dares to be something edgier. From a technical stand-point the movie is a bit of a wreck. The acting is dreadful, the editing is often sketchy and the dialog can be downright embarrassing. But there are a few hugely risky maneuvers that writer/director Robert Hiltzik finds a way to make work. And those special and strange little nuances, along with a jaw-dropping final twist, make Sleepaway Camp a mandatory summer watch. In 2014 Adam MacDonald gifted the horror world a quiet little piece of terror that deserves an infinitely larger fan-base. Backcountry is insane, and everything about it, other than the fact that we’re dealing with some campers, is unique to the other movies on this list. What the film does is inject a terrifying realism and a sense of hopelessness that sinks to the bottom of the belly. It’s a frightening film, and it’s frightening for reasons no other movie on this list can claim. There are two different found footage films named Evidence out there. One features Radha Mitchell, and the other features a handful of virtual unknowns. The Evidence we’re talking about is the latter, which takes the stalked-while-camping idea to extremely strange and entertaining new heights. I can’t spoil the final act for you, but I can tell you it will leave your head spinning, and it’s exceptionally creative – particularly for a found footage effort. This one is on the cusp of arrival, so what I can tell you about is extremely limited. I refuse to spoil the movie before it’s even accessible to the masses. What I can tell you is that writer/director Damien Power gives us a Hitchcockian piece that succeeds as much in developing tension as shocking with a somewhat taboo climax. The movie is well shot, and although it may end on a slightly bleaker note than most, it’s profoundly entertaining. I think most of us have been waiting for a high caliber Jersey Devil flick forever. Darren Lynn Bousman finally gave us one back in 2012, but somehow the world let it slide right on by without stopping to give it a look. That’s a mistake. This is a rare piece that finds a way to mix psychological horror with good old fashioned monster mayhem, and that combination makes for a truly intriguing film that, while not perfect, is certainly worthy of a solid rating. 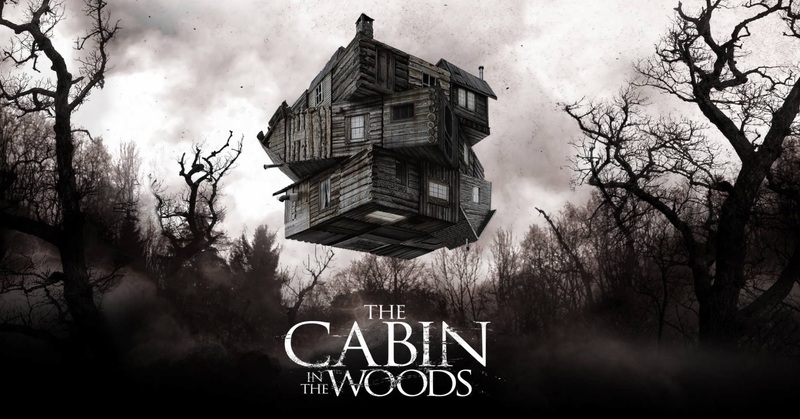 Cabin in the Woods freely defecates on the countless movie tropes we associate with camping horror, and it smiles wide the entire time. Initially we’re led to believe that a group of young college kids are going to be offed in predictable fashion by a predictable killer. That’s not what happens, at all. Instead we get everything that is potentially great about standard camping fare in addition to one of the bravest and most rewarding plot twists history has provided. To skip on this one is criminal.